Plumber putty can sometimes be a nuisance to handle, and you may be looking for a more workable solution for installing drains, or other plumbing fixes. Today we are going to be looking at three products on the market right now, that are great plumber putty alternatives. The first plumber putty alternative up for review is the Oatey 25605 Hercules 6-Ounce White Tube Plumber's Caulk. Today we have decided, instead of focusing on just one huge plumber putty brand, to focus on three of the largest. This allows you to have a wide spectrum to choose from, especially since there are thousands of alternatives of plumber putties available on the market today. We will be going through each of them, all of their features, including their pros and cons, so you can see what brand is going to work best for you. What we can say beforehand is that all three of these brands have a lot to offer and they are known for providing high-quality products at affordable pricing, which is why they are on our list. This first product has been developed by Oatey. If you know plumber putty, you know that Oatey is one of the best manufacturers for all things plumbing. They create high-end products that work, at a fraction of the cost of similar products. This is why they have made quite the name for themselves throughout the plumbing community. This alternative putty product is actually siliconized acrylic-latex caulk to be used instead of putty. It has a really smooth flow for consistent placement during a job. Inside the tube, this caulk will never harden and it does not crumble. When used, it resists shrinking by any means so you can feel good once a job is complete. The material is durable, flexible, resistant to any mildew, and waterproof—which is great for leaks. It is also at an incredibly affordable price. It comes in a compact 9-ounce tube that measures 6” by 1” by 1”. Flows easily, does not harden in tube or cartridge, will not crumble, resists shrinkage. Flexible, durable, extremely mildew-resistant, waterproof. 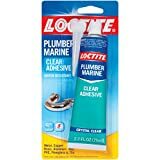 The Loctite 1716864 Tube Plumber and Marine Adhesive is the second product on our list today and is another best plumber putty alternative. Loctite is another manufacturer that we trust, especially because of the attention to detail within their products. You can tell that they take great pride in the products that they put out. As well, they know that people live life on budgets, which is why they have created affordably priced products that will last a long time. This alternative to plumber putty comes in a 2.7-ounce tube for bonding aluminum, brick, ceramic, glass, leather, many plastics, rubber, steel, wood, and cardboard. It has can seal leaks around the home. If you have a tile that is loose, this adhesive has been built to secure it back in place. Outside of home care, it also can fix shoes and footwear, and mend your glasses back together in case of a break. What makes this product so great is that it dries transparent, making it easier to use it places, without it becoming an eye sore. It also has a drying method that takes its time, allowing you to reposition something if it is not up to your satisfaction right away. This takes the pressure off that you have to do it perfectly on the first try. Once it is dry however, it is watertight and leak resistant, making it one of the best alternatives to plumber putty on the market today. The final product on our list today is the LDR 502 7200 Tub Caulk, another alternative for plumber putty. It has been manufactured by LDR Industries, the final company on our list today. We hope now that you have all three of their names, that you will do some extra research yourself on each company. Find one that you want to buy one and support, as they all have their strengths and weaknesses. We can assure you that LDR Industries is a competitive standard for the best alternatives to plumber putties and they make high-end products that will work around your home. This caulk from LDR has a white finish after using it. The adhesive is made of silicon rubber, for easy usage and to hold tight. Its main goal is to seal cracks throughout the home easily and efficiently in record-setting time. The product comes in an 8-ounce tube, but it also can be hung up. Tubes that can be hung up are very beneficial when trying to tidy up your garage area. If you are a beginner to using a plumber putty alternative, this LDR product comes with an easy installation instruction manual, so you won’t do anything wrong. The common theme between the three products with the con is that these tubes simply don’t come with enough product. They would benefit from having a larger tube to choose from so you can buy in bulk. That being said, the products themselves work outstandingly and are great to have around the home. They are going to fix cracks in places you never thought possible and provide a strong hold which is resistant to water. It is up to you to find out whether you want one that dries clear or one that dries with a white finish.